A few people have asked me what I think about Elly Fishman’s well-written Chicago Magazine feature on Humboldt Park anti-gentrification activist Jose Lopez. It’s hard to say. One thing that makes it hard is that it’s tough to know what you’re responding to; something Fishman does well, I think, is represent the feelings of people whose ideas about the situation have almost nothing in common. That’s true not just with respect to their ideas about what should happen – that’s easy enough to organize a debate around – but also about what is happening, how cities work, what a neighborhood means, and so on. It’s hard to build a story, or an argument, when the most fundamental facts of the case are themselves up for debate. There is, to begin with, the perspective of the white (or otherwise privileged) outsider. In the piece, entrepreneur Brendan Sodikoff plays that role with a malice-tinged cluelessness. “It’s the next frontier – that’s how I feel about it,” is how he’s quoted. There’s a lot packed in there: there’s the sort of facile, and inflammatory, undertone of colonialism, using – as Lopez points out – language taken from a more or less genocidal period in American history. But I think more importantly, the “frontier” language reveals something that’s under-acknowledged about most of the city’s non-white neighborhoods, which is that they have experienced a kind of social death in the minds of the city’s white and professional-class residents. By which I mean that, socially, they might as well not exist. It not only would never occur to any of these people to go to Humboldt Park (or South Shore, or Austin, or…); it would never occur to them that anyone they might ever interact with would go to those places either. When they meet a person from those neighborhoods, they’re not quite sure how to react; they exist beyond the bounds of what they consider “normal” society, despite the fact that they make up a majority of the city. To the extent that they come up at all, it’s in the context of reasons that you should never go there, i.e., crime. What Sodikoff is saying is that he’s bringing Humboldt Park back into existence, back from social death, for people in his world: California and Augusta is a corner that they might go to now, think of as a real place. For him, and many others, that’s an unambiguously admirable thing to do. 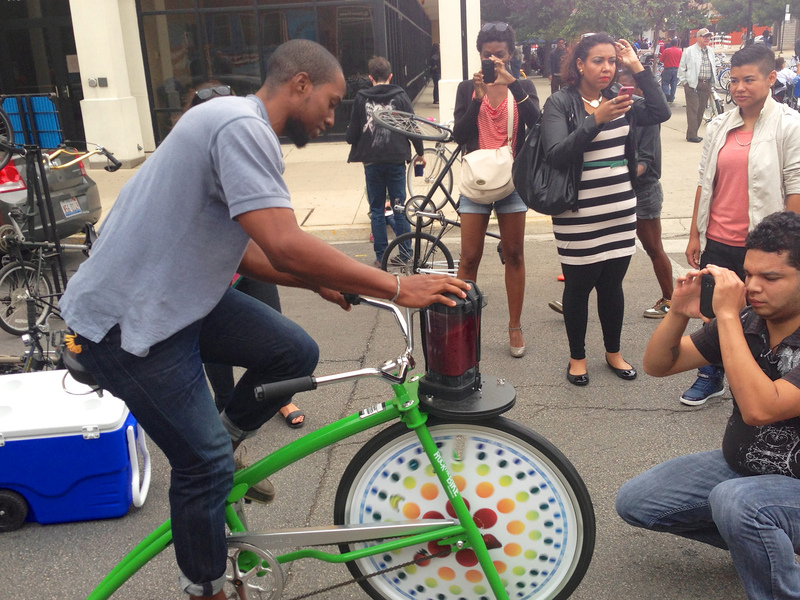 It’s a funny notion: Birkenstock-wearing, craft-beer-swigging millennials as barbarians. But that’s only a funny notion if you have no baggage about the role that upwardly mobile white people have played in the story of neighborhood change in Chicago. And that, in turn, is only possible if you have ruthlessly forgotten most of what has happened in this city for the last century or so. If you’ve forgotten about the hundreds of thousands displaced by urban renewal, and the incredible violence that accompanied Chicago’s transition from an overwhelmingly white city to one in which whites are a minority, and so on, then sure, there is no reason to be nervous about a sudden influx of white folks with economic and political capital. For everyone else, I think a sense of alarm is pretty intuitive. Several steps removed from this are the academics. 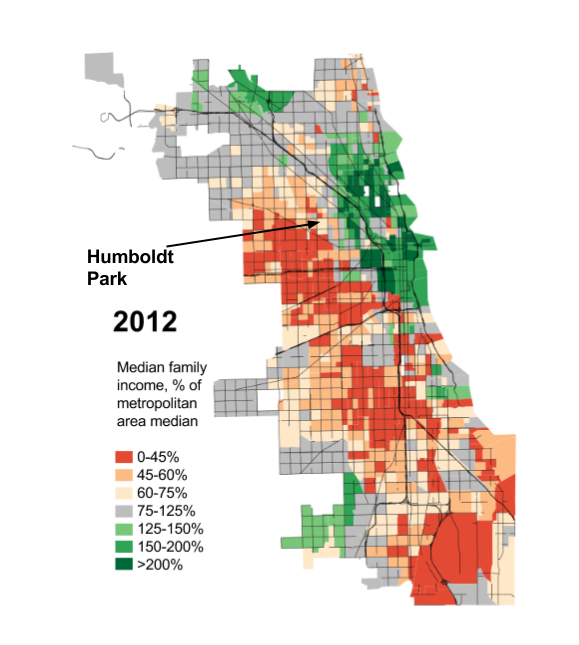 For them, looking at the broad sweep of ethnic and racial transitions in the city, what’s happening in Humboldt Park seems pretty unexceptional, and making a fuss about it seems kind of silly. To be clear, I think this sort of 40,000-foot view is actually really valuable: things that seem unique, or random, or confusing from the perspective of someone experiencing a changing neighborhood, actually turn out to be part of very regular patterns when seen in the larger context of the city. This happens to be true on both sides of the change in Humboldt Park: white-collar gentrifiers are moving there because it is simply the next neighborhood in the path of the high-rent zone of the city that has been growing out from Old Town, roughly, since the 1970s. And, on the flip side, Humboldt Park is losing Hispanics to neighborhoods further north and west, and to the suburbs, in a pattern that has been evident for decades, and which applied to “white ethnics” in the exact same locations prior to that. 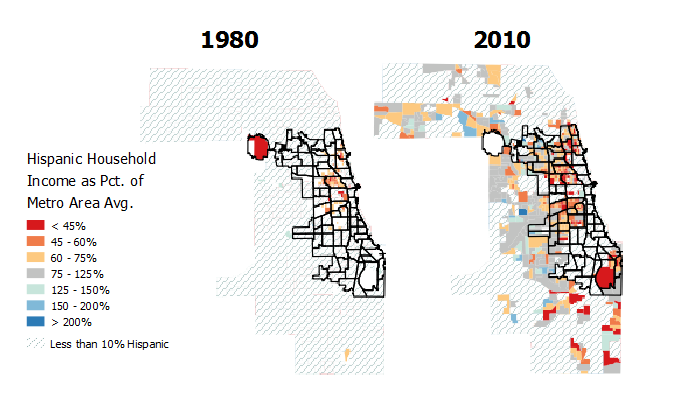 The growth of Hispanics in Chicago and suburban Cook County. Between 1980 and 2010, many tens of thousands of middle-class Hispanics have moved from the city to the suburbs, or in some cases moved there directly from Puerto Rico or abroad. What I think needs to be kept in mind, though, is that the fact that something is predictable or even unavoidable doesn’t make it less traumatic for the people experiencing it. As I’ve written before, it’s very far from clear that maintaining highly segregated communities is something we should, on balance, want; but it is clear that there are perfectly legitimate reasons for people like Jose Lopez to want Humboldt Park to remain mostly Puerto Rican. We’re not doing him or ourselves any favors when we dismiss those goals out of hand. In part two: Lopez himself. Previous Previous post: Dear journalists/community groups/alderman: please report the demographics of your public meetings. Thank you! Good piece, Daniel. I think you accurately depict the sides pitted against each other in the article and how they’re represented. You and I have discussed this before — you cannot underestimate the shunning or “social death” phenomenon of low-income minority neighborhoods, and the do-gooder instinct to improve them. What else comes across is the inevitability of change by the change-makers, or even those resistant to change but aware that forces are larger than them. The choice is either/or: Humboldt Park will either stay as the city’s Puerto Rican cultural center, or the wave of gentrification will sweep in a brand new demographic. I wish there was a midpoint. There is a midpoint for those who wish to find it. Thanks. Yeah, I’d love to find the midpoint. Frankly, as far as Humboldt Park, at least east and north of the park, I’m pretty pessimistic we’ll find it. (1) Safety/Crime, (2) Transit / Commute time to Loop, (3) Amenities (Retail, Restaurants, Parks), (4) Quality of the housing stock itself, and (5) Schools as a lagging factor. Over the past decade you had a major improvement in near north side public K-8 education. Families are no longer fleeing to the suburbs at the same rates they once were. Prices have responded. Single college graduates, both yuppies and hipsters are increasingly priced out of these neighborhoods by family minded 30 yr old professionals. They are generally flocking to the blue line corridor, which is far more affordable and has seen a dramatic increase in “amenities” over the past decade, with Bucktown as an anchor. The demand won’t stop (until we hit another recession, which would be small comfort for the incumbent residents of Humboldt Park), but as you often say, increasing the supply might slow the wave. A massive opportunity is rezoning the riverfront from Manufacturing to Residential, and rebuilding Finkl Steel & Goose Island. If you’ve been to the old Cabrini Green district recently, you see the new supply going up there. (That article also blames transplants from even higher city rent markets like San Francisco and New York).